A dear friend of our youngest daughter invited my eldest daughter and me to the art gallery. I'm almost embarrassed to say that I've never been to our local art gallery. Now that's been remedied. The collection of pottery from the 1970s and 80s made me smile. This was the kind of thing popular when we were married. Now it's collectable and valued enough to be shown in art galleries. I was struck by how some of the designs, notably that of the black and white plate, look up-to-date for this decade as well. As my daughter said, "it looks like something you'd see at Ikea." It was Family Day at the gallery. The parking lot was full to overflowing and in various rooms throughout the gallery children sat at tables creating art. In other spaces they played with lights, creating shadows on the wall, as shown above. While taking my photos (once again with my phone), I also created some shadow art - did you notice it there on the black and white plate in the mosaic? Emily Carr is a famous Canadian artist from Victoria. I grew up in the interior of our province and when I first saw her paintings of coastal forests, they were incomprehensible. It was only when we moved to the area that her work began to mean something more than brushstrokes on canvas or paper. I felt the same way when I went to Provence and saw those twisted cypress trees that Van Gogh loved to paint. Emily Carr loved the woods, as do I. She wrote, "Go out there into the glory of the woods. See God in every particle of them expressing glory and strength and power, tenderness and protection." I love to visit the Gallery on a weekday when I have it all to myself. Imagine my surprise one day to visit an exhibit to see a portrait of an immediate family member - that old mansion suddenly felt very home-like! Funny how we don't go to local things. But maybe now you will return again. And I always feel good that I have my phone with me for photos when I don't have my camera. Kind of a security because I do like to take pictures! So often we overlook the value of our local art galleries. You've reminded me that I haven't visited any of ours for a very long time. I must pay a visit. I too just adored that black and white plate. It's a thing of beauty. Thanks for taking us along on your visit. That was really enjoyable. I haven't visited my local gallery either. For shame. Yours is lovely! Sounds like a really cool place to visit. I took years to learn appreciate Emily Carr's work, now I understand what she was trying to show us...she is an amazing treasure. What a lovely museum visit! I just love the forest painting, always happy to see an artist loving the woods and nature. Great post, have a happy week ahead. I love art galleries and museums. Looks like you had a lovely, interesting visit to your gallery. I love hand made pottery. Fun post! Love that piece by Emily Carr and her quote! It's funny how we sometimes miss out on the things our own community has to offer. My local gallery has a couple of painting by Emily Carr; you've reminded me that it's time to pay a visit there. Now I want to go searching for the painting by Emily Carr that I fell in love with some years back. Until then, I had not been aware of her work. How fun to "recognize" the painting because you know those kinds of places, too. Yes, that plate looks exactly like something would see now. Everything comes 'round again. I think I found it except that I don't remember the totem poles in it It was a tree-lined road that is very reminiscent of what we would see here (minus the totem poles). Emily Carr depicted the forests of Vancouver Island well. Love her work...and her quote. Glad you could go and view the art firsthand! Love the Emily Carr quote, and your photos of the art gallery. I haven't set foot in one in years... and look what I'm missing! 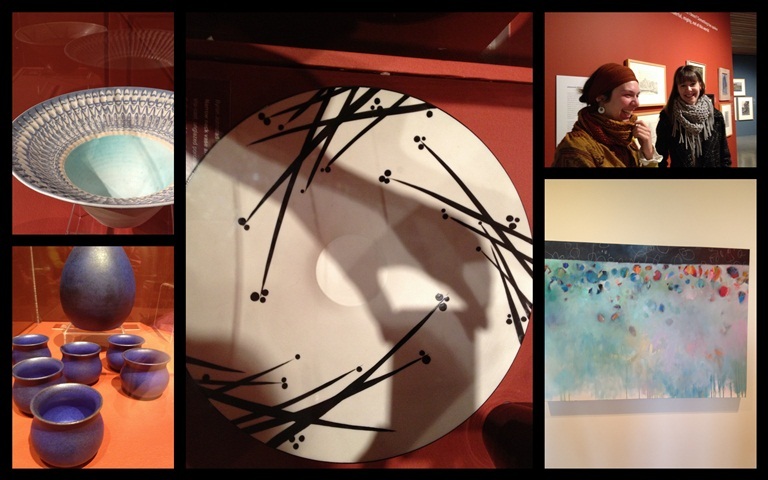 I loved this trip back to the Victoria Art Gallery. When I was 12 my Grandmother enrolled me in a painting class at the top of that magnificent staircase in the original house and I loved the time I spent there painting. When I visited the Art Gallery a few years ago I told my art class story to a woman who was working in the gift store. She had taken painting lessons the same year and from the same teacher. She remembered her well because the teacher was her mother. It often surprises me that I am old enough to recognise exhibits in galleries and museums as items used by me or my parents. Ah well, maybe I am a museum piece myself. We were at the Victoria Gallery a few years ago for a marvelous exhibit of the work of Takao Tanabe. Not sure why we haven't ever managed to get back again. There's always so much to see, isn't there, and too little time! What a wonderful visit to the gallery. We love hand made pottery...it's always so unique and beautiful! Happy Monday! You created a beautiful mosaic from that pottery (which I well remember)....what a fun visit for you and your daughter. Great to patronize local galleries! What a beautiful museum, and such a lovely mosaic! I haven't been back to any museum for ages.. I'm glad you got to be a tourist in your town. Better late than never! I don't get out as much as I used to (part of it due to the distance we are from The City) but I appreciate a good museum or gallery that much more when I DO go. I did not realize Emily Carr was a native to Victoria. It is nice to be a tourist where you live. Usually happens when you have out of town company.